Gain valuable insights into your business by visiting your sales analytics! Knowing your most popular products and sales channels can help you optimize your listings. Don’t forget you can also utilize Google Analytics in conjunction with Teespring Analytics, learn more here. There are two places you can access your analytics. The first is by clicking the analytics icon while in the “Products” section of your Teespring account. Once you’ve clicked the Analytics icon you will be taken directly to that specific listing’s analytics. From there, you customize the date range, learn where your page traffic and views are coming from, see the number of sales Teespring is driving for you, and more. 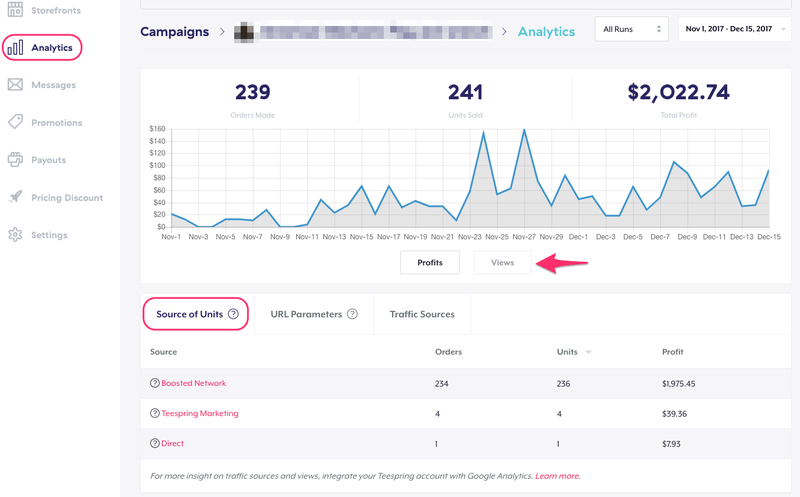 You can also go straight to the “Analytics” section of your account to see a summary of all your sales analytics. 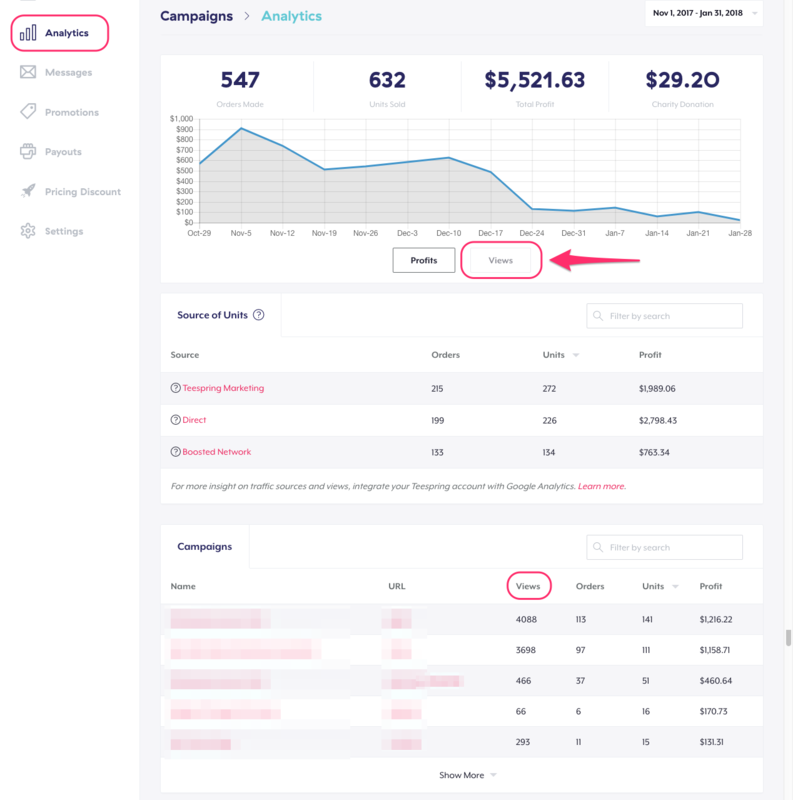 This summary shows data on orders, units, views and profits across your entire account. You also have the ability to select individual listings for more insight. Once you click on an individual listing you’ll be able to see the following sales metrics. You’re also able to see the number of views your listing has had on teespring.com within a given period of time. Orders Made: The number of orders made on your listing. You can click on this number to see a breakdown of placed orders and canceled orders. Units Sold: The number of products sold within each order; you can click on this number for a breakdown of placed units and canceled units as well. Total Profit: The profit you will earn based on the total number of products sold. If you are working with different currencies, the profit may fluctuate slightly based on exchange rates. Source of Units offers a straightforward view of where your sales are coming from. All of your sales will either come from Teespring Marketing, Teespring’s Boosted Network, or they will be Direct sales (sales driven by you through paid ads, online promotion, etc.). You’ll also see the total orders, units, and profit generated by each sales channel. URL parameters can offer valuable insight on which URLs are driving the most traffic and views to your listings. For example, in the screenshot below we can see a promotion code drove 65 page views (teespring.com/listingURL/?pr=25OFF). Let’s say you shared this link within a specific Facebook group—now you know exactly how many page views you got from it. You can test different URL parameters to see which audiences are the most responsive. Learn about how one seller uses URL parameters and variables to gain valuable insight on her Teespring sales here. Anyone can create a URL parameter by simply adding a “?” at the end of their Teespring listing link with key-value pairs. In the screenshot below for example, teespring.com/listingURL/?pr=25OFF = “pr” is the key (promotion) and “25OFF” is the value. 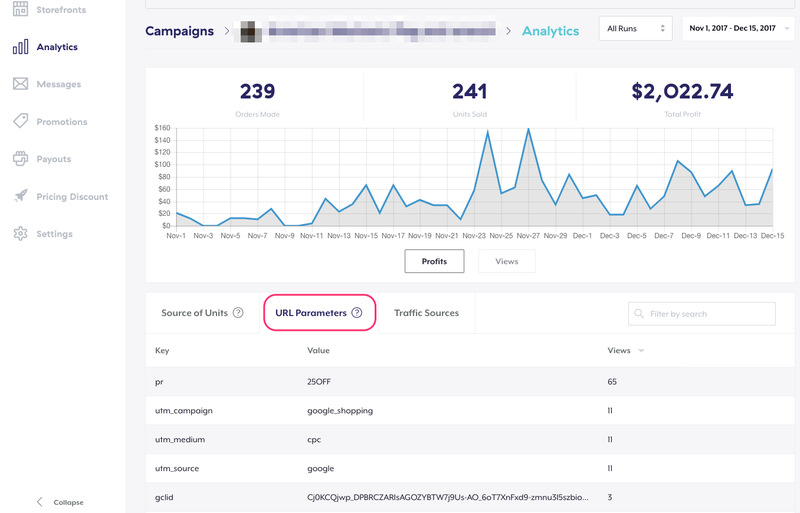 Keep in mind Teespring Marketing uses specific URL parameters and they can appear in this section of your analytics. For example when we advertise your products through Product Listings Ads on Google or when we share your listings through retargeting ads on Facebook. Don’t forget URLs can often have multiple parameters on the same URL (e.g. teespring.com/listingURL?utm_source=pinterest&utm_listing=listing1). This means that the same view may appear multiple times in this table for each URL parameter. 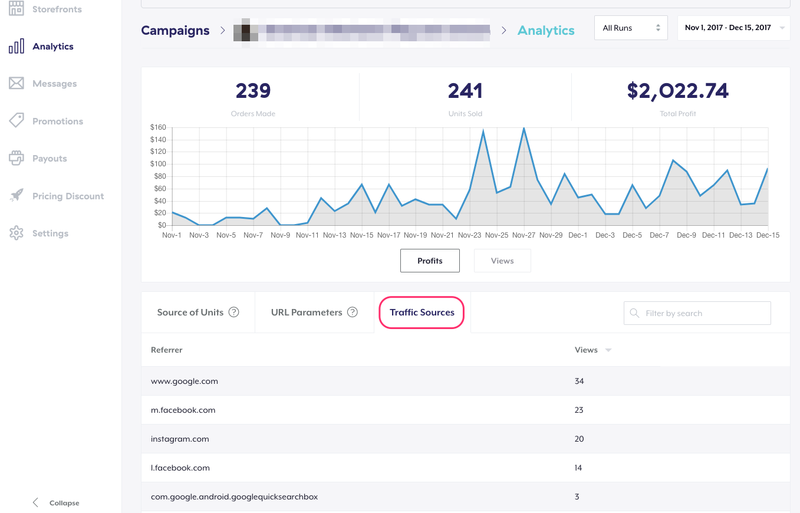 This section shows you a breakdown of where your page traffic is coming from. For example, you can see how many views you’re getting from a variety of social media channels, websites, etc. Keep in mind these sources will also come from Teespring Marketing (example m.facebook.com is usually our retargeting ads). Use this section to see what your most popular products and colors are. If you notice one product is selling better than the others you can update your advertisements and promotional images accordingly. 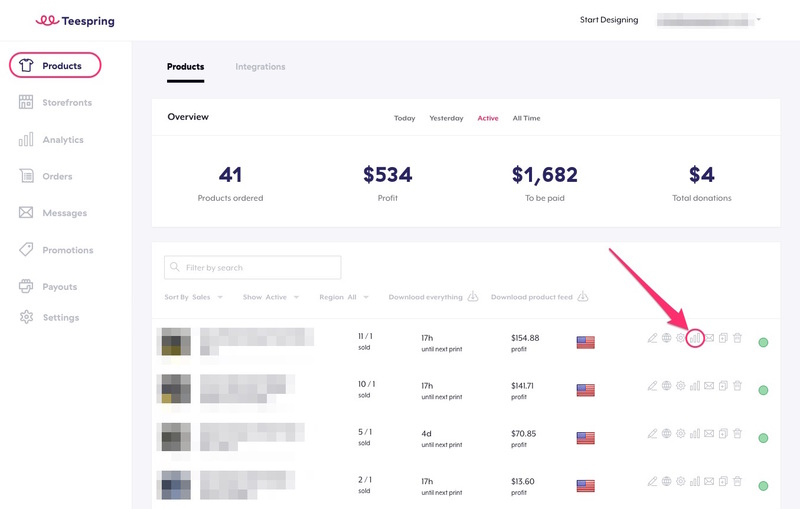 You’ll also see a clear breakdown of your total profit per sale after costs are deducted (for example if you offer a discount code) or if a CPO (cost per order) is applied from Teespring Marketing.